International Journal of Research in Health Sciences,2014,2,3,734-739. 1Associate Professor, Department of Microbiology, Bangalore Medical College and Research Institute, Bangalore 560002, Karnataka, INDIA. 2Intern, Bowring and Lady Curzon Hospital, Bangalore 560001, Karnataka, INDIA. Background: Indiscriminate use of antibiotics has led to a state where multi drug resistant bacteria have become increasingly prevalent. The knowledge of antibiotic resistance patterns is necessary to stop the continued emergence of resistance. Objective: This study thus aims to provide the antibiotic resistance patterns of the gram negative clinical isolates. 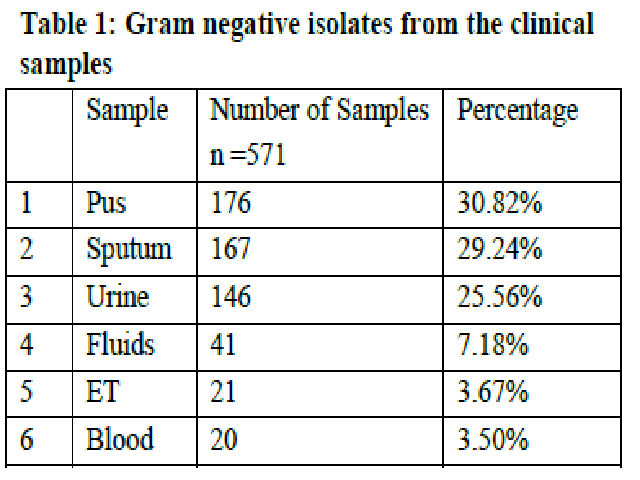 Method: Five hundred and seventy nine gram negative isolates from various clinical samples such as pus, urine, sputum, blood etc., were tested for their antibiotic sensitivity profiles. The clinical data was obtained from the respective units and wards of the patients. Results: Majority of the gram negative organisms isolated were found to be sensitive to Imipenem [9.28% resistant], Amikacin [20.84% resistant] and Piperacillin + Tazobactam [24.69% resistant]. Most of the gram negative organisms were resistant to the routinely used drugs, Norfloxacin [96.49%], Nitrofurantoin [94.92%], Carbenicillin [85.98%] and Amoxiclav [78.28%]. Conclusion: The results of the study conducted demonstrate the distribution and susceptibility pattern of the commonly used antimicrobial agents. The importance of strict antibiotic policies, evidence-based empirical therapies and rigorous surveillance programs to prevent the further spread of resistant bacteria cannot be overstated.